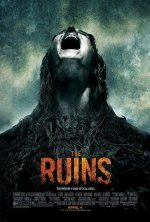 The Ruins release date was Friday, April 4, 2008. Four American friends on vacation in Cancún, Mexico, meet a German tourist that persuades them to join his hunt for his younger brother, who was last seen with his girlfriend near some mysterious ruins. Based on the best-selling Scott B. Smith novel.